When I was twenty, I spent the summer in Florida before moving down permanently. 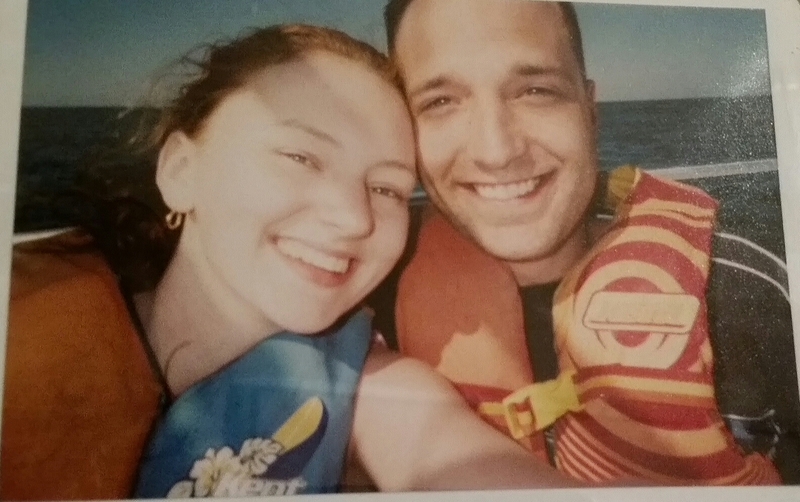 At the end of that summer, the day that I was flying out, my (now) husband and I went to the beach. After watching a few brave individuals go parasailing, we decided to go too. When signing all of the waivers, the instructor asked us how high up we wanted to go. I looked at my husband with my left eyebrow raised. Instructor: We start at 500 feet, then 1000 feet, 1500 feet and 2000 feet. Instructor: We’re the only company in the county that goes that high. Husband: 2000 feet?! Are you sure? Me: If we’re going to do it, we’re doing it right. All the way up! We picked out our life vests, sealed our valuables in a zip lock bag and headed to the shoreline where the boat was waiting. We boarded and headed out into the ocean. It was incredible. The wind was blowing the hot summer air, the sky was a clear blue and the ocean was a light blue-green. There were huge sea turtles swimming off the shore and dolphins playing in the waves. It seemed as if we could see for miles – the ocean in front of us, the coastline on each side and the city behind us. My husband and I were both smiling ear to ear the entire time. When we were being brought back into the boat, the captain playfully dipped us into the ocean so our feet could touch the warm, salty ocean water. Though it only lasted a few minutes, the moment has stuck with me for years. It was one of the most amazing experiences ever. I often think back on this memory and smile. I can’t imagine being brave enough to do that again. I have since become terrified of heights and I am pretty sure that I would worry about the line snapping the entire time that I was up there, not allowing the opportunity to enjoy the moment. But I did it. I was brave enough. I didn’t think twice about it and it was awesome. As time goes on, I have developed a tendency to worry about every possible outcome and what could potentially go wrong. Sometimes, I have to stop and remind myself that I am the same girl who spent an entire summer with the man that she loves in a state that she didn’t call home. I am the same girl that went parasailing 2000 feet in the air on a hot summer day. I can be brave. So tell me, dear friends, what makes you feel brave? Opening my heart makes me feel brave. I’ve grown into a person who fears getting too close to people for fear of getting hurt. That feeling of opening up and giving someone a real chance to get to know me and I get to know them in return is what makes me feel brave. The human spirit is an amazing thing and when I get the chance to truly glance someone’s inner self while giving some of mine, it’s an amazing feeling. I have always loved your ability to be true to yourself and others. You are an incredible person and I am so glad that I am lucky enough to know you! I LOVE this memory!! I need to find those pictures. I was terrified too but I’m so glad that we did it!